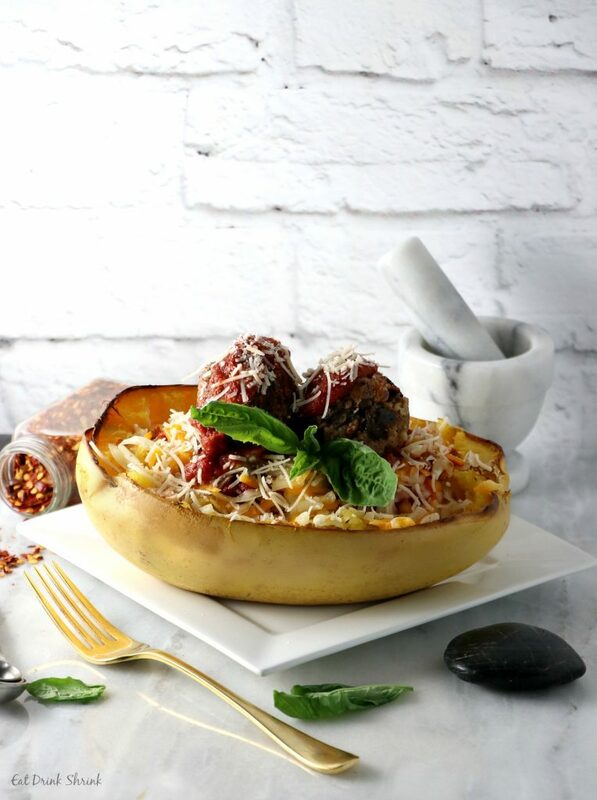 Spaghetti Squash with Meatballs - Eat. Drink. Shrink. My favorite time of the year like everyone else’s is the holidays! 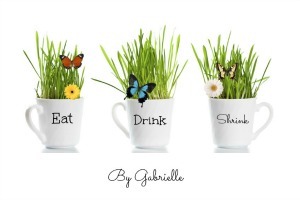 It personally brings me so much joy as I love family gathers and of course cooking! Each year I entertain friends and family its another opportunity to make memories, but also share some of my recipe favorites and even test out some new concepts! This year I decided to explore a recipe for spaghetti and homemade meatballs, but instead of traditional noodles I opted for squash! I know what you’re thinking, eating healthy? on the holidays? 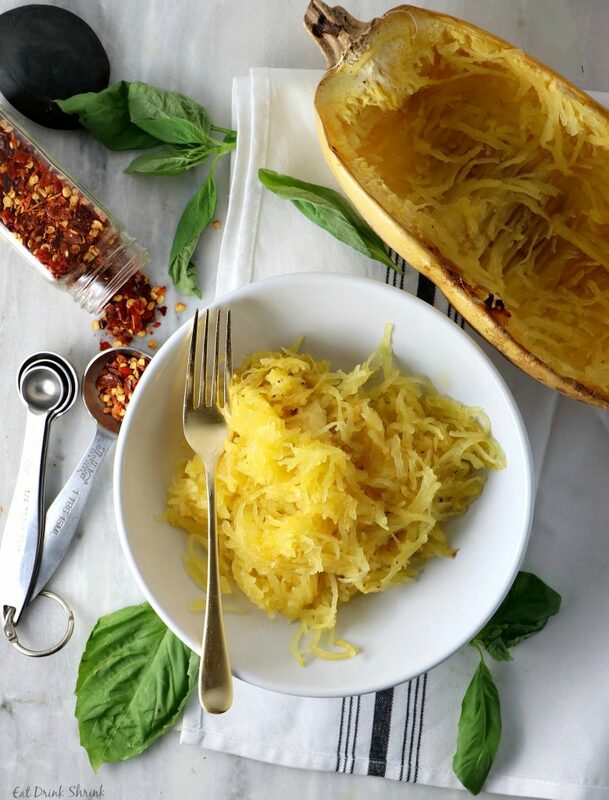 I know, but spaghetti squash noodles provide more flavor, different texture, added nutrients, and the vegetable itself can be used as a serving dish to mitigate dish washing! (my least favorite thing to do every day. 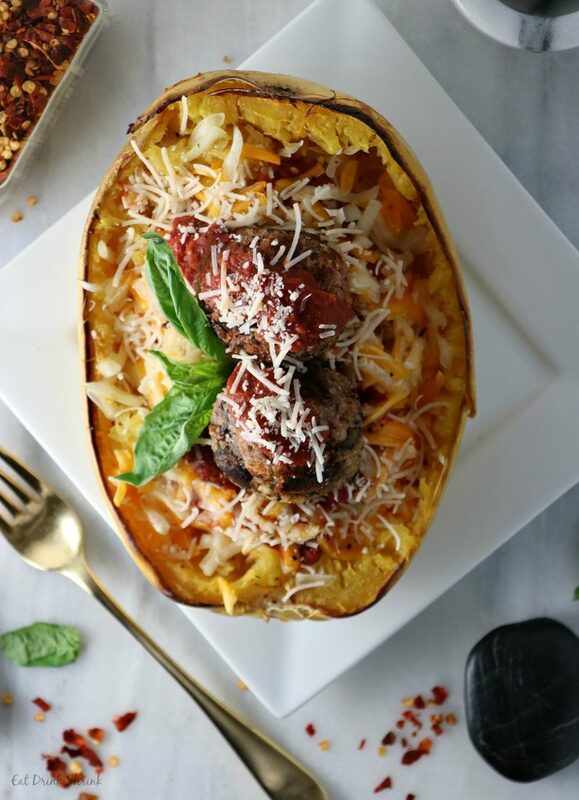 This recipe for vegan spaghetti squash with homemade meatballs is a home run because it involves little cooking skills, a handful of ingredients, can be easily made in bulk, the meatballs and sauce can be used in a variety of dishes (perhaps zucchini noodles), and the squash can be left in the oven to bake while you accomplish other Thanksgiving tasks. Having an affinity for Italian dishes during the holidays is a blessing and a curse for those who attend my Thanksgiving dinner. Recipes are typically made with red sauce and lots of spice, leaving guests vulnerable to experiencing heartburn. 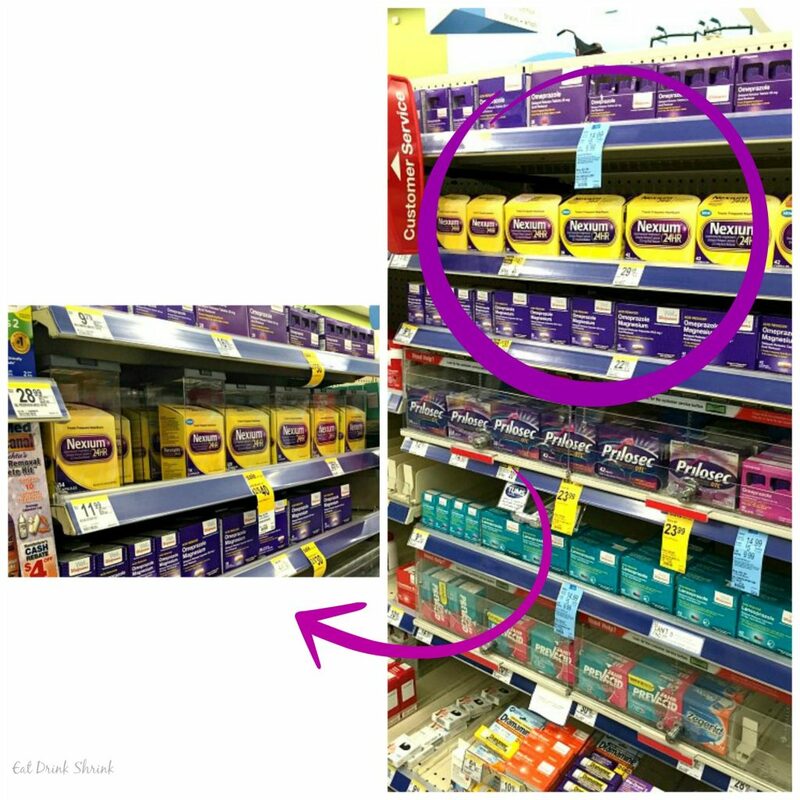 Since heartburn could be just around the corner for some of my guests, many reach for Nexium® 24HR Tablets 42ct. Its an effective OTC medicine that aims to effectively provide relief from consistent heart burn. Although it doesn’t provide immediate relief, it can alleviate pain if taken 1-4 days in advance. For those who have consistent heartburn episodes, especially when consuming a variety of foods outside their normal food routine, its an ideal option. Heart burn medication is not recommended for long term use as your body may become conditioned to receiving the product leaving you ultimately bound to the product to maintain normal digestion. Other strategies to mitigate heart burn symptoms are to limit consumption of fluids during a meals as it dilutes stomach acid to break down food, sit upright following the ingestion of food for at least 60mins or more, don’t consume peppermint post meal as it weakens the cardiac sphincter allowing your bile to flow upwards and cause discomfort, and be vigilant when consuming foods that are high in fat or very spicy. 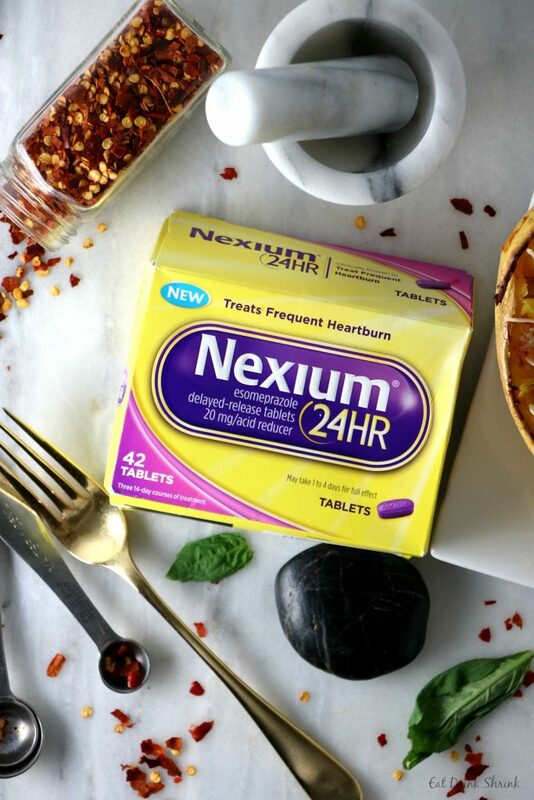 If you’re looking to have a care free holiday sans heartburn, Nexium® 24HR provides protection from frequent heartburn so everyone can savor the best of the Holidays. Just one pill a day provides all-day, all-night protection from frequent heartburn – no matter what triggers it. 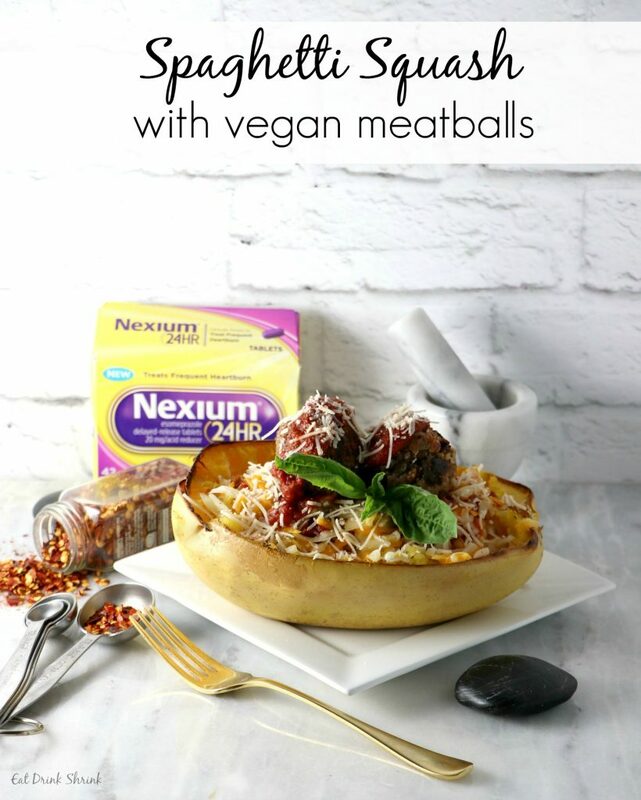 What I love about this recipe is that its effortless, affordable, has great presentation, the meatballs can be made together with family and friends, has high protein, low fat, less carbs with spaghetti squash noodles, can be made in bulk, and is non vegan approved! 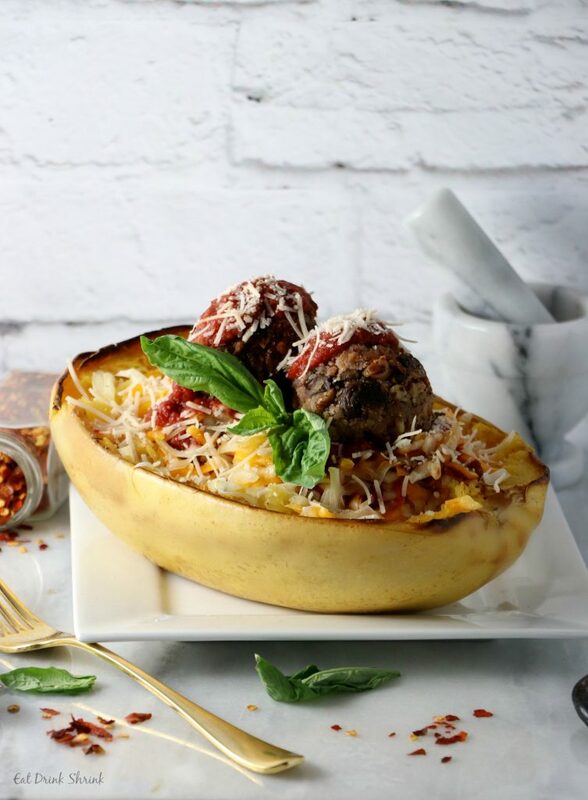 If you’re looking for that perfect holiday Italian dish with a modern spin that packs low calories and lots of nutrients without sacrificing flavor..
You have to try my recipe for vegan Spaghetti Squash with vegan Meatballs! Preheat oven to 350F. Place walnuts on lined/sprayed baking sheet and bake for 10 minutes. Once done, remove from oven and leave oven on to bake the spaghetti squash. Slice the spaghetti squash in half and scoop out the soft inside with a spoon. Lightly coat with olive oil and season with salt and pepper. Bake face down for 30 mins or until for tender. Once cooked set on 400. 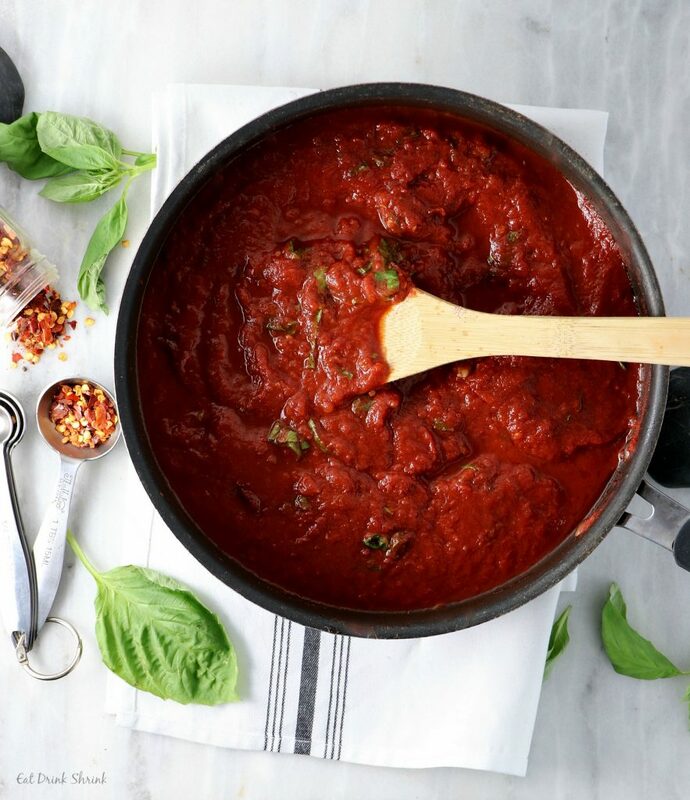 In a medium size pot add minced garlic, cook until translucent, then add a can of crushed tomatos and basil and cook for 5 minutes to combine flavors. In a pan over medium heat add minced garlic and a drizzle olive oil. Cook until translucent. Add the mushrooms, onions, italian seasoning, and continue to cooke for an additional 5-7 minutes. Rinse and drain beans. Lightly smash beans with your hands leaving the majority of it mashed with a few solid beans. 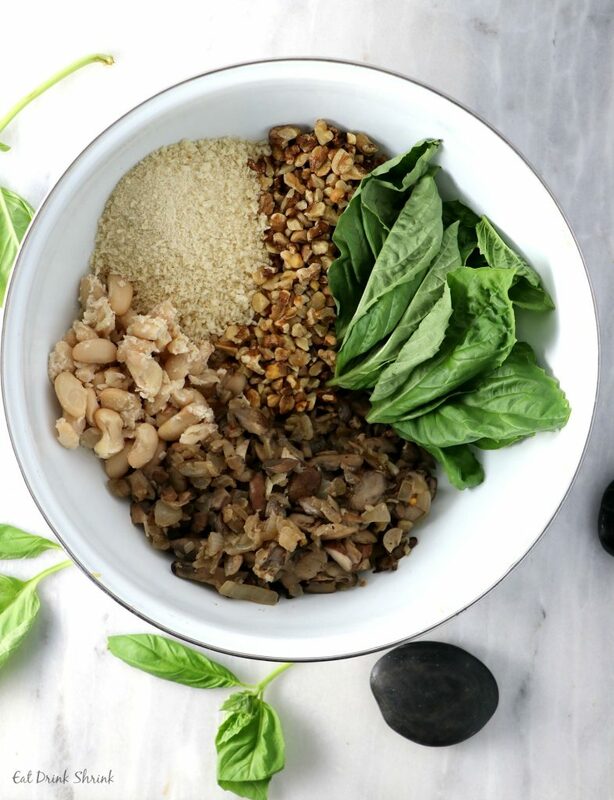 In a large bowl combine the Panko, beans, walnuts, mushroom/onion mixture, red pepper, basil, and salt/pepper. Press the mixture into balls and set aside. In the same skillet over medium/high heat add a drizzle of olive oil and cook each ball for 5-7 minutes making sure to rotate for an even cook. 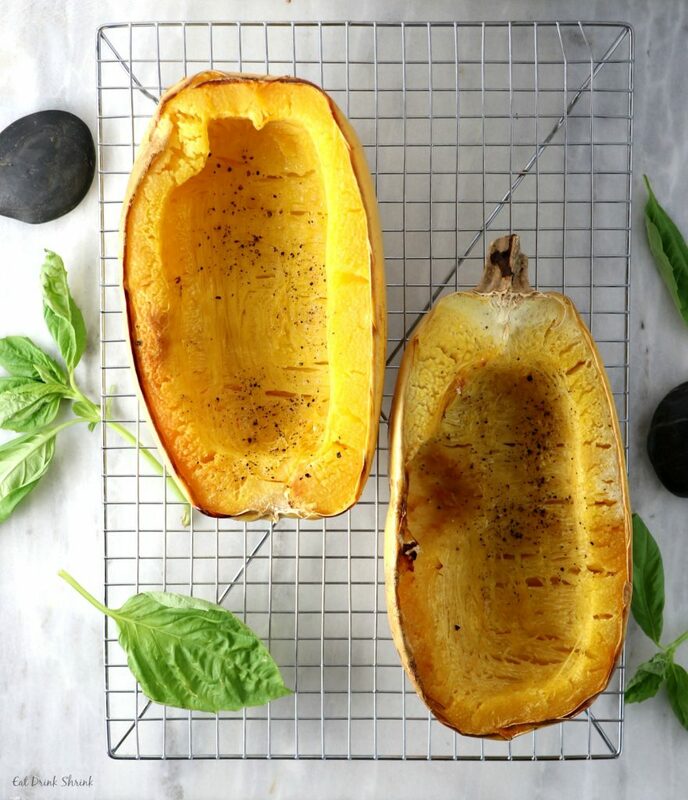 Remove spaghetti squash from the oven. let cool, and shred the squash with a fork. Once shredded add the squash back into the shell, top wth red sauce, vegan cheeses and meatballs. Bake for 5-7 minutes until cheese is bubbly. Serve hot!